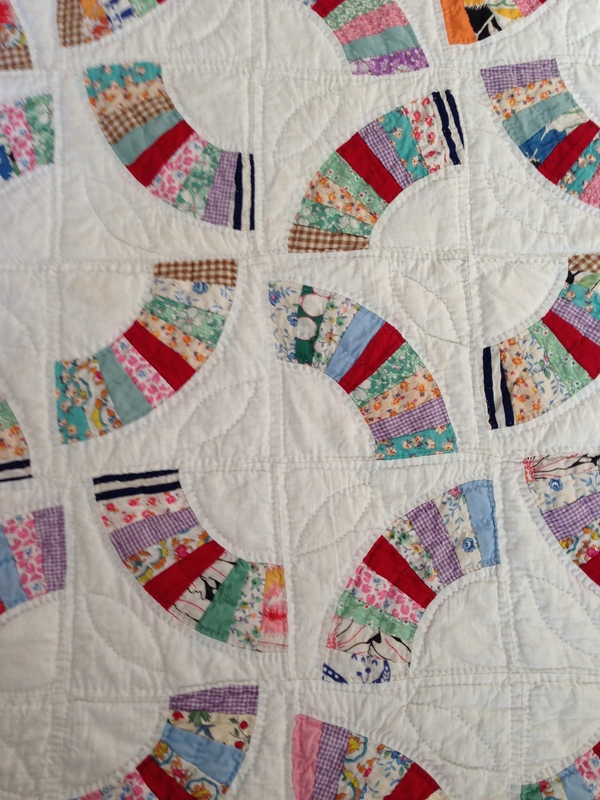 ~ Quilt Study, Sewing, Vintage Textiles, Collecting quilts and other old odds and ends. In times past when home dressmaking was a common practice and many a mother was kept busy stitching clothing for her often large family, scraps of cloth would have accumulated quickly from her endeavours as she produced dresses, shirts, nightwear and linens for her household. No scrap would have been wasted and fabric would have been collected from worn out clothing, household linens and feedsacks. These fabrics would go into the scrap basket to be put to good use for the making of patchwork quilts. The ‘scrap basket’ represented the fashions of several years and would often include older pieces than what was typical of the era the finished quilt would represent. As any-one who has a collection of sewing scraps knows, we seldom get to the bottom of the basket. 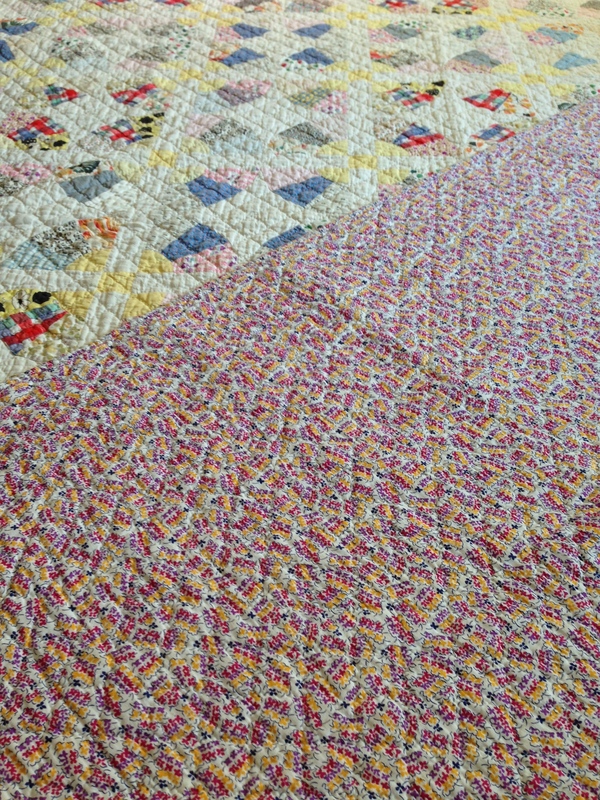 One quilt leads to another and the scrap pile continues to evolve. Detail of Basketweave quilt showing a collection of fabrics both plains and patterned. 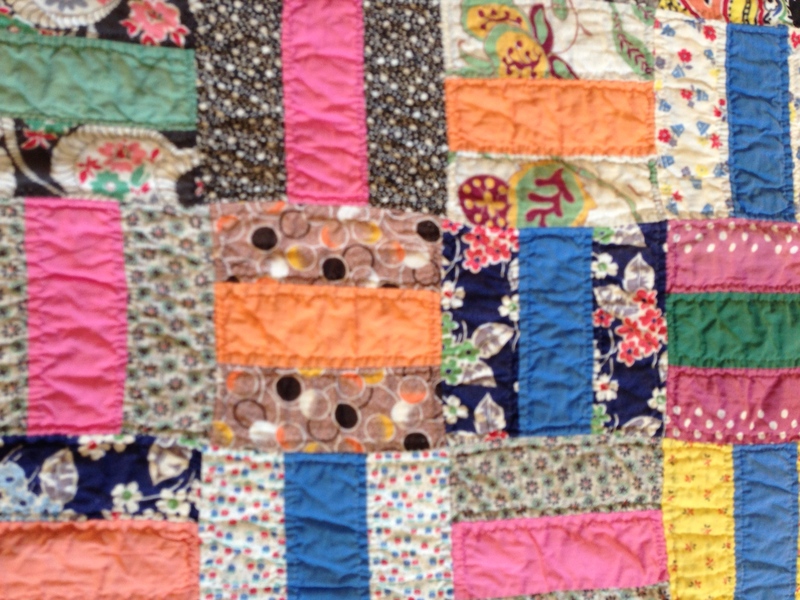 Whether the quilts demonstrate artistry in the arrangements of design and colour or the effect of the design is pure chance, scrap quilts made from a collection of fabrics will always be my sentimental favourites. Scrap Fans, Circle of Friendship or Around the World. The Around the World Quilt, (which has many other names) came to me from the collection of Bernie and Eileen Donnelly. 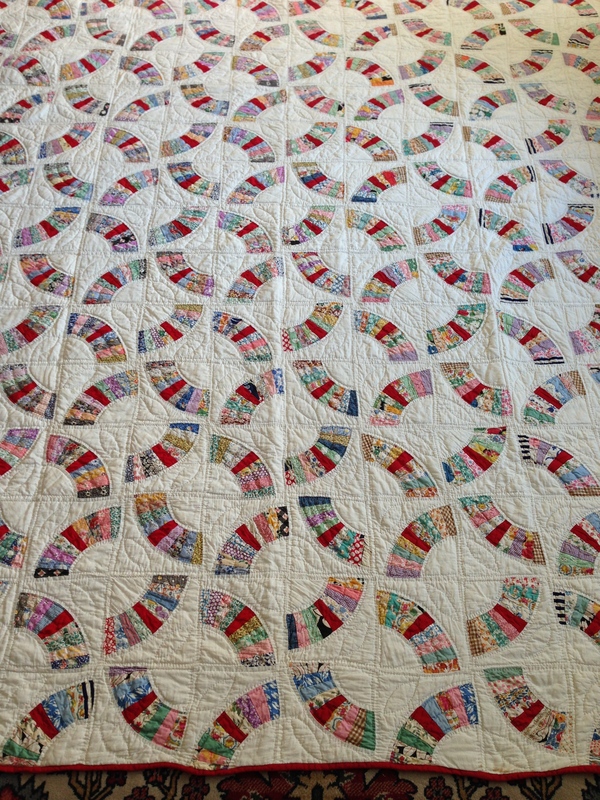 It is a beautiful quilt which they purchased at an exhibition of old and rare North American Quilts and Canadian Quilts by John Leach at South Yarra, Victoria in 1995. It was stated that the quilt was made by Old Order Mennonites from the area of Elora and Unionville in Southern Ontario Province in Canada.The quilt has quite a heavy batting, which is lovely on these cold Winter nights. 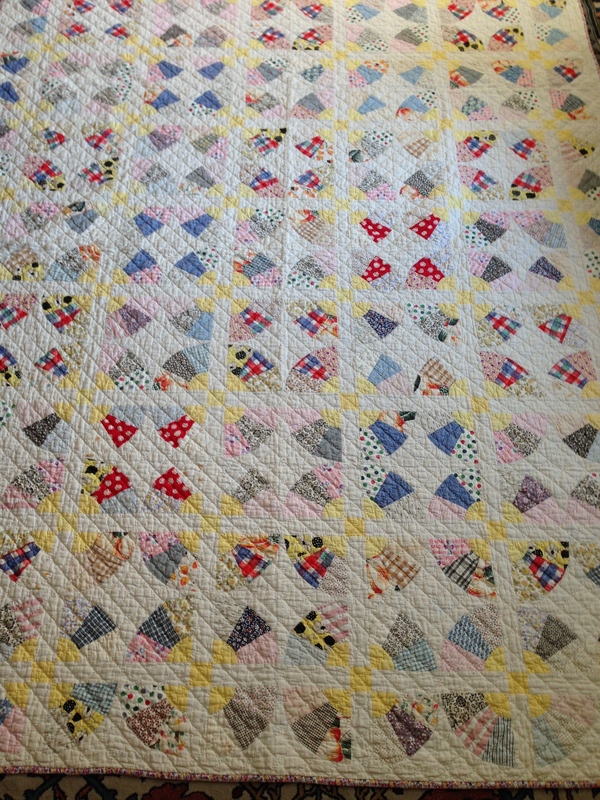 Eileen commented that the quilter used an exceptionally clever arrangement of the small fans. The yellow setting squares in the sashing tie in with the yellow bases of the fans. The fans are appliquéd onto the block with very fine machine stitching (probably a treadle machine was used). 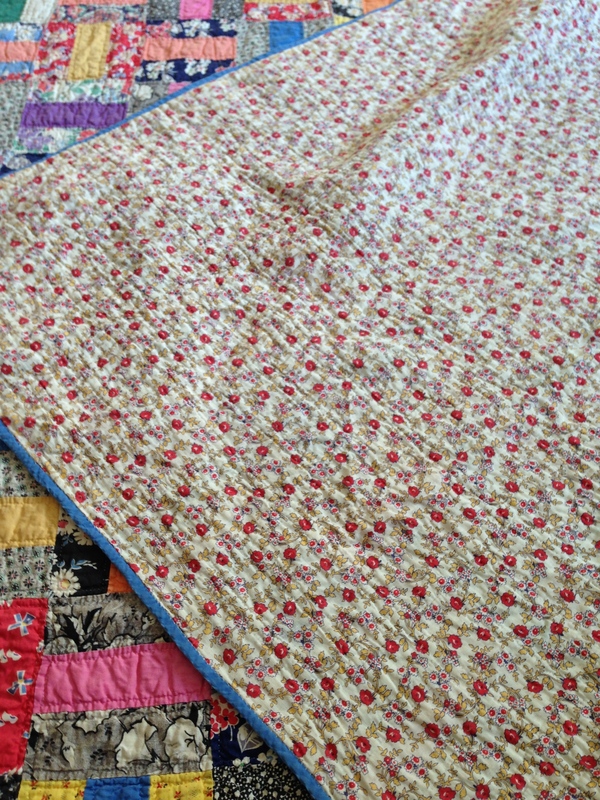 The quilt is hand quilted and has a feedsack backing. Another quilt that contains many scraps and displays an artistic use of colour is this gorgeous Fan Quilt from the 30s. 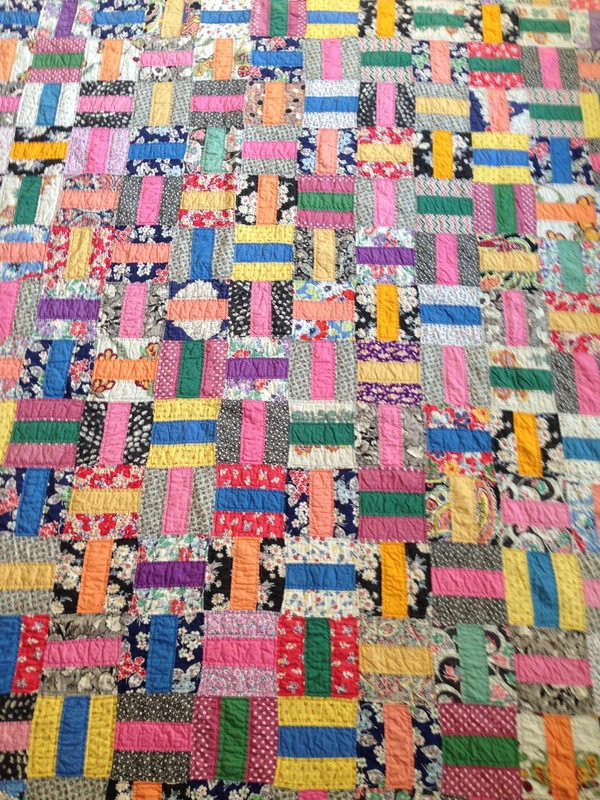 The quilt is very typical of the Depression era. When I purchased this quilt it had never been washed although it does have a sleeve for hanging on the back, so I presume it has been displayed at some point in time. The simple design of the Fan becomes a very sophisticated quilt with the placement of red in the centre of the nine tiny blades that create the fan. 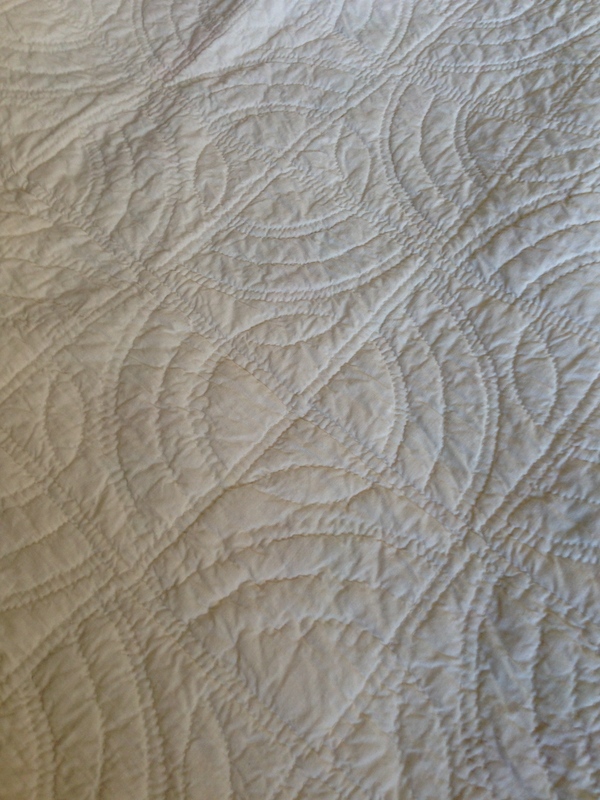 The quilting further enhances the effect created when the fans have been arranged by the maker to create an illusion of another design. Detail of Fans and arrangement of blocks. My Scrap Collection includes many different fabrics, many of them bought at op shops including woollen material which I use for rug hooking. 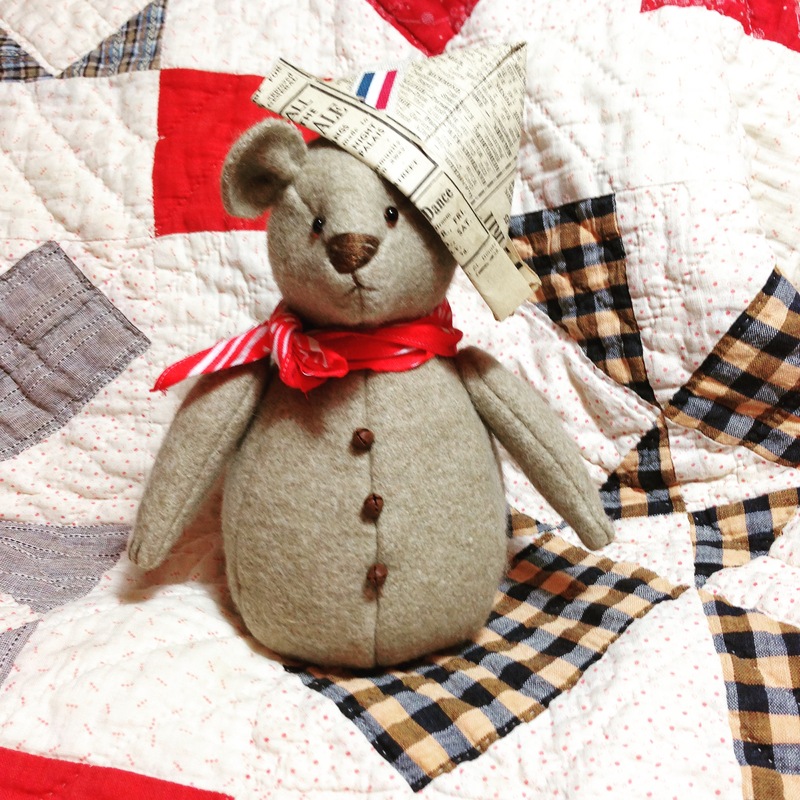 When I saw this darling little bear pattern in the Spring Edition of Primitive Quilts and Projects, I just had to make it. I found some heavy coating scraps in the wool trunk and made my version of Roly Poly. I just adore the paper hat. Happy fabric collecting, Warmly Janette, The Plain Needlewoman.